e-Buddies promotes social inclusion online for people with intellectual and developmental disabilities. In e-Buddies, people with and without intellectual and developmental disabilities, such as autism and Down syndrome, come together online to form friendships and a community that celebrates their diversity of character and abilities. Anyone can be in e-Buddies! You can join on your own or sign up your special education class. e-Buddies is great for students and adults with and without disabilities. e-Buddies is an e-mail pen pal program that provides safe opportunities for one-to-one e-mail friendships between people with and without intellectual and developmental disabilities (IDD). Computers are an integral part of modern society, providing access to an abundance of social and creative outlets. By participating in e-Buddies, members develop technology literacy skills and become more confident communicating online, opening up opportunities for higher-level education and employment. Fifty-four percent (54%) of Members with IDD revealed that they feel more confident engaging in other online social outlets as a result of their participation in e-Buddies. e-Buddies matches a person with IDD in an online friendship with a person without IDD. Participants are matched based on age, gender and similar interests. Anyone over the age of 10 can participate in e-Buddies. Students are matched with other students and adults are matched with adults. e-Buddies is available throughout the United States and internationally for English-speaking people. e-Buddies is always free for people with IDD. After joining e-Buddies, we will match you with someone from another state (or even another country). Get to know your e-Buddy by e-mailing regularly. Your e-mails can be short or long and your conversations can be about whatever you both want to talk about. You’ll quickly make a new friend! e-Buddies is dedicated to ensuring the safety and privacy of all our participants with and without IDD. By adding e-Buddies to your computer technology lessons students are more motivated to learn. Students that are involved in e-Buddies are more interested in spelling and typing correctly. Instead of typical computer assignments, these e-mails go to friends and your students receive positive reinforcement by getting an e-mail in return. People with intellectual and developmental disabilities are not always given the opportunity to develop meaningful relationships outside of their families and the people paid to support them. 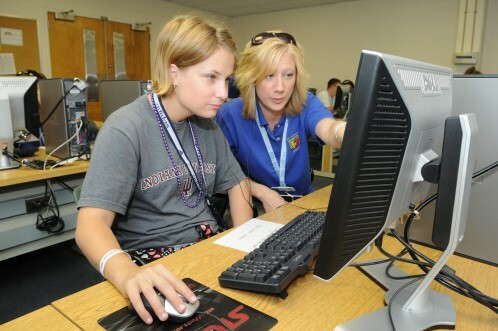 e-Buddies allows participants to connect with a peer in a one-to-one friendship. Often, after graduating from school, people with intellectual and developmental disabilities have fewer chances for social interactions. The Internet can become the main way these individuals keep in touch with family and friends. By joining e-Buddies in school and becoming comfortable with communicating online, students are more equipped to stay social in the future.